In the last four months, Gabriel has made huge progress in the speech and language department. The changes started in mid-December (just shy of 2 1/2 years old), when his vocabulary really took off — all of the sudden he was using a lot more words (language) though many of the words sounded similar and were difficult to distinguish (speech). 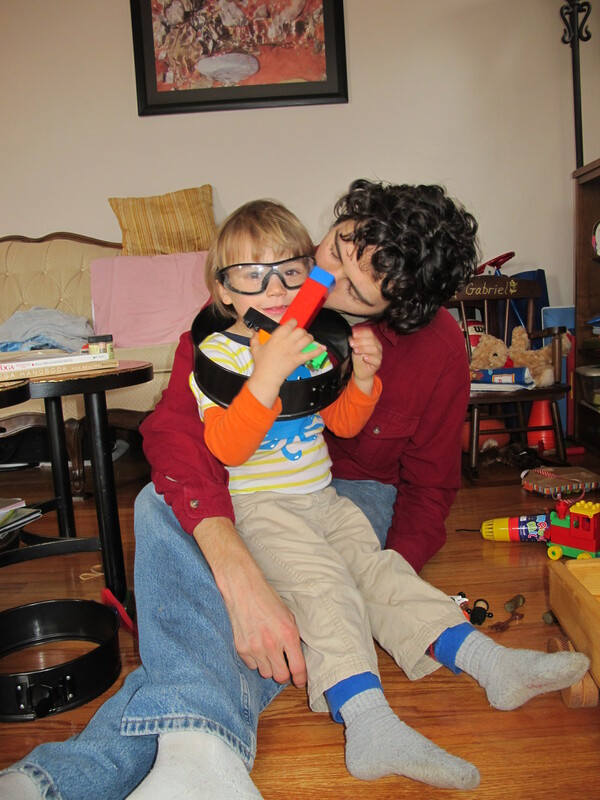 In mid-January, we started speech therapy, and between that and just finally being developmentally “ready,” he’s really taken off: greatly expanded vocabulary, phrases and sentences, and slowly making progress on articulation. While we get a lot of, “Be careful what you wish for, once he starts talking, you’ll never get him to shut up,” type comments, I’m enjoying all of the talking, except what is uttered in a whiny voice (but there was whining before he was talking much). Me: How are you feeling this morning? He can also tell us what he’s feeling . . .
Me (to a crying Gabriel): I know you don’t want to put away your toys and brush your teeth right now, but that’s what we’re going to do. G (crying): Feel really sad! I’m thrilled that he’s starting to verbally express his feelings. However, such statements are no more effective than crying when it comes to swaying Mama. He uses, “Lil’ bit,” as a response to many questions, and, as Matthew describes it, he sounds like a little Southern girl when he says it. “Love you soooo much!” This one is pretty much self-explanatory. He surprised me by counting to ten last week. I thought we were counting to three or four for rocket ship blast-off, but he just kept going, all the way up to ten! He’s pretty good with manners, often using “Please” and “Thank you” appropriately, with no prompting. He hasn’t quite figured out what to do when someone thanks him, though. Me: Thank you for picking up your toys, Gabriel. G: Thank you, too, Mommy. Me: This is . . .
Me: He was a good little . . .
Me: And always very . . .
Yep, “Cutesy George.” This is one of my favorites, and, sadly, one that he already seems to be outgrowing. He can’t completely get his tongue around “cur-i-ous” just yet, but it’s sounding more like “curious” than “cutesy” every day. We are just now hitting the “Why?” stage. The word started popping up in a few places two or three weeks ago, but it’s really been in the last week that he’s started using it all. the. time. Sometimes, it works to turn the question around on him. The “why’s” got particularly repetitive on a car ride the other day, so I started having fun with it, making up random responses. G: Why going this way? Me: Because this is the way to Papa’s house. Me: Because the unicorn said so. You have to be able to have fun with this, right? Either that, or go completely out of your mind. This entry was posted in Cuteness and tagged parenting, toddler. Bookmark the permalink.